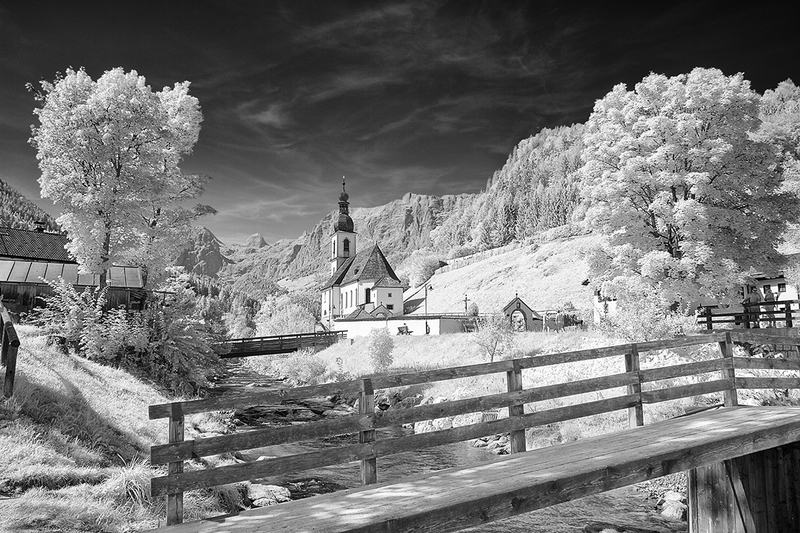 Situated a few kilometres west of Berchtesgaden, the Parish Church of St. Sebastian in Ramsau has two claims to fame. The first is its achingly beautiful location in a valley, surrounded by mountains, with a couple of wooden bridges spanning the Ramsauer Ache, the river that passes alongside. As a photographer one could spend hours here taking photographs – and then return again and again to shoot in different light or weather conditions. The second is that the poet Josef Mohr (1792 – 1848) was, for a short period in 1815, the parish assistant in the church. The following year, when working in Mariapfarr, he penned a poem that was to become, arguably, the most famous carol in the world. Two years later, on Christmas Eve 1818, he asked a friend, Franz Xaver Gruber, a school teacher, if he could set the poem to music to be sung at the midnight Christmas Mass a few hours later. That original poem was entitled ‘Stille Nacht’ in German and was subsequently translated into English as ‘Silent Night’.